So I entered another Food52 contest, and I think I submitted the wrong entry. The problem is, I waited until the last minute to start testing my recipes, and so it came down to crunch time (second tart was still baking at 8:30 pm on the night the contest entry was due), and I went on blind faith that the one in the oven was the better choice. While it was delicious, I now think that I entered the wrong one…the first one I made was even better. My main reluctance to enter the first tart I made (Pear-Citrus-Rosemary Tart) was that it wasn’t as original as the second one. 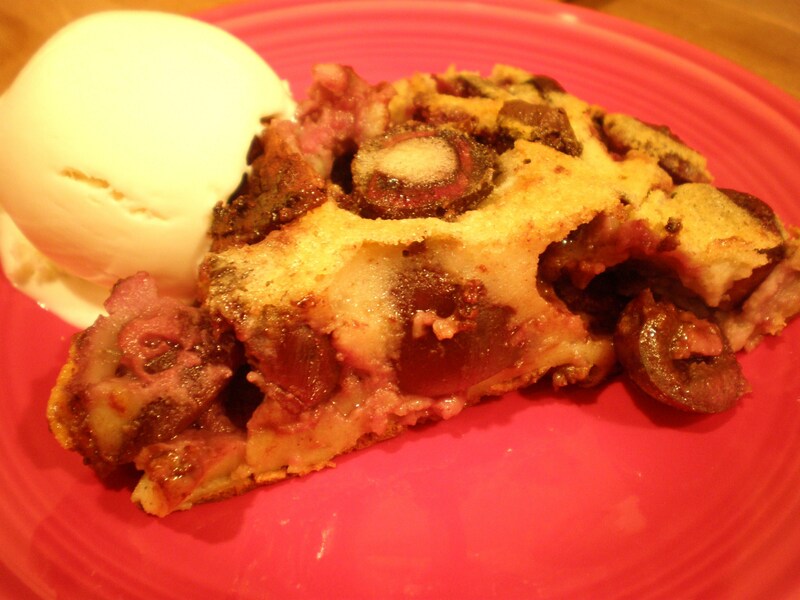 It was inspired by a sweet pizza recipe that Aunt Suzy gave to me several years ago, and I didn’t change that much other than using a tart crust rather than sweet pizza dough, and using butter rather than olive oil. 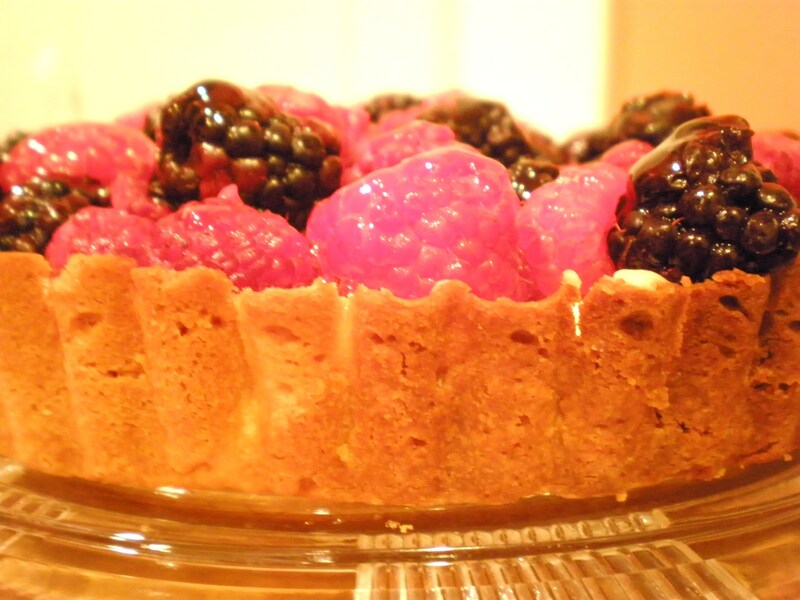 The second tart I made was based on this cake recipe, and obviously, since it came from a cake recipe, I changed quite a bit. Preheat oven to 375 degrees. Bake tart pastry according to directions, then brush egg yolk onto the baked shell with a pastry brush and bake an additional 2-3 minutes, until the yolk is set and shiny. Drop the temperature on the oven to 350 degrees. Set shell aside. Peel and slice the pears into 1/8″ slices into a medium bowl. 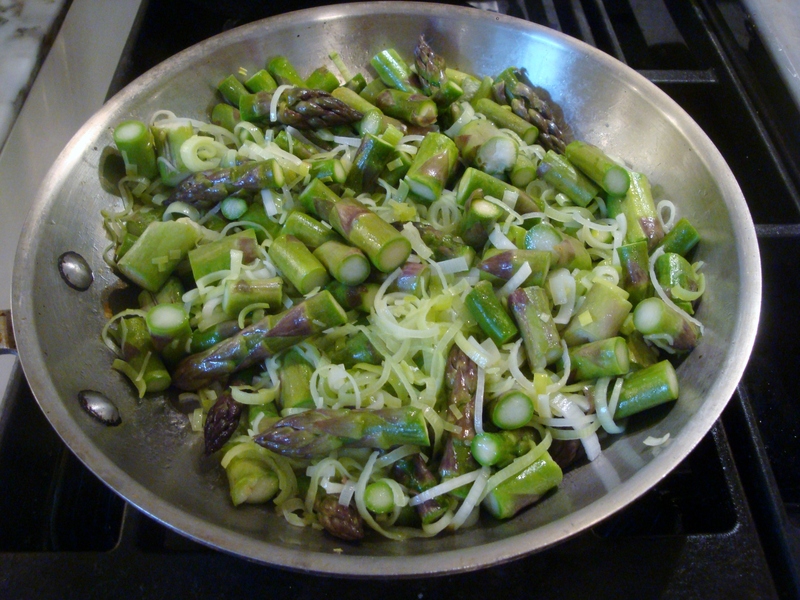 Toss with the lemon juice and set aside. In a small bowl, mix together the sugar, orange peel, cinnamon, rosemary and pepper. Sprinkle in the butter, and cut with a pastry-cutter until crumbly like a streusel. 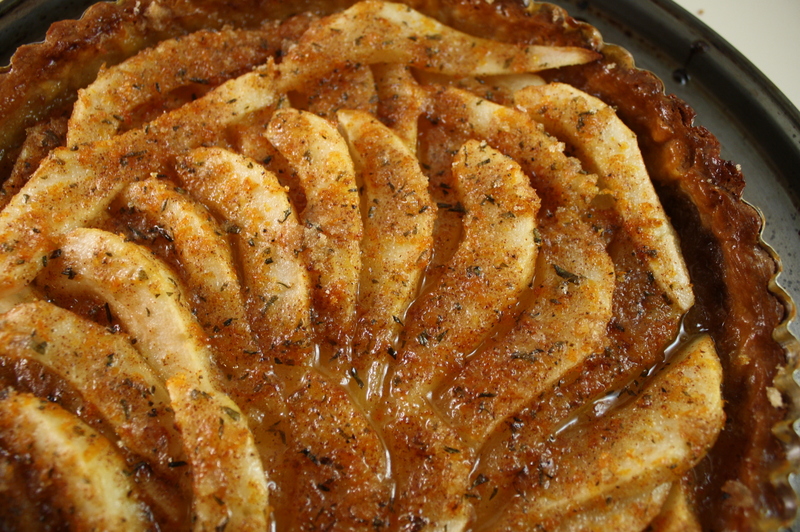 Layer the pears in the tart shell, overlapping them in a pretty pattern (if you’d like). Sprinkle the streusel over the top of the pears. Bake 40-50 minutes, until pears are soft when pierced with a fork and top is golden brown. 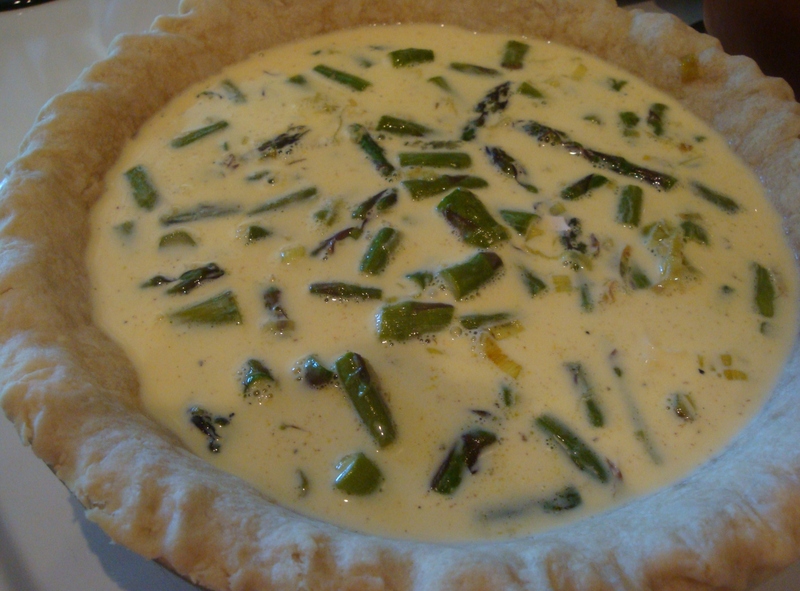 Place tart on a cooling rack and cool completely. Remove outer ring carefully, then slide a completely flat and thin spatula or knife between pan bottom and tart, and slide onto a completely flat serving plate. Serve the day it is made. Peel and slice the pears into 1/8″ slices into a medium bowl. Toss with the lemon juice and ginger. 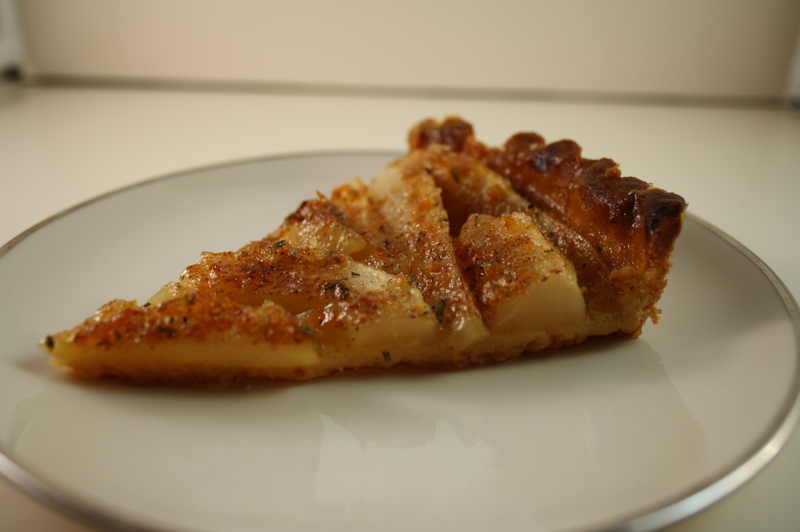 Layer pears into the baked tart shell, overlapping into a pretty pattern. Sprinkle with turbinado sugar. Bake for 40-50 minutes, until pears are soft when pierced with a fork and top is slightly browned. 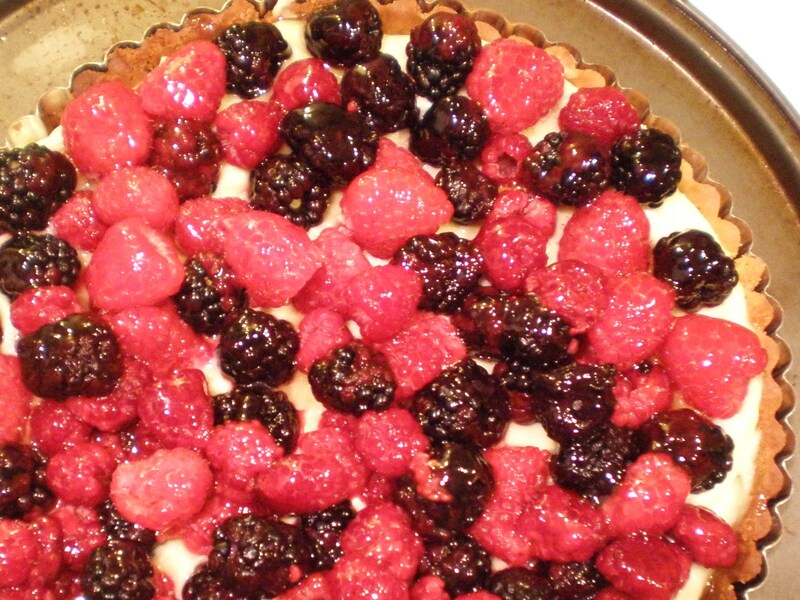 Place tart on a cooling rack and cool completely. Remove outer ring carefully, then slide a completely flat and thin spatula or knife between pan bottom and tart, and slide onto a completely flat serving plate. Serve the day it is made. It’s my birthday!! My husband asked me if I wanted him to get me a cake, or if I wanted to make it myself. 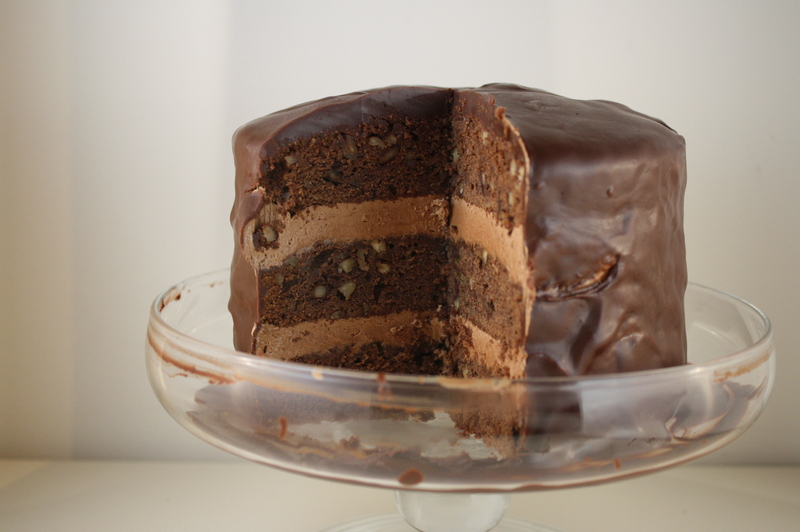 I’m a total cake snob, and have yet to really find a bakery in Chicago that has cake as good as homemade. I’ve found decent ones, but still not good enough, so I usually make my own cake. This year was no exception, and I’ve been really wanting to make the cake that was featured on the December cover of Bon Appetit…it looks heavenly!! Maybe a little labor-intensive, even when not making the white chocolate and milk chocolate ribbons to wrap it up in, but hey, it’s my birthday! Totally worth the work. The cake part is actually pretty straightforward and easy. 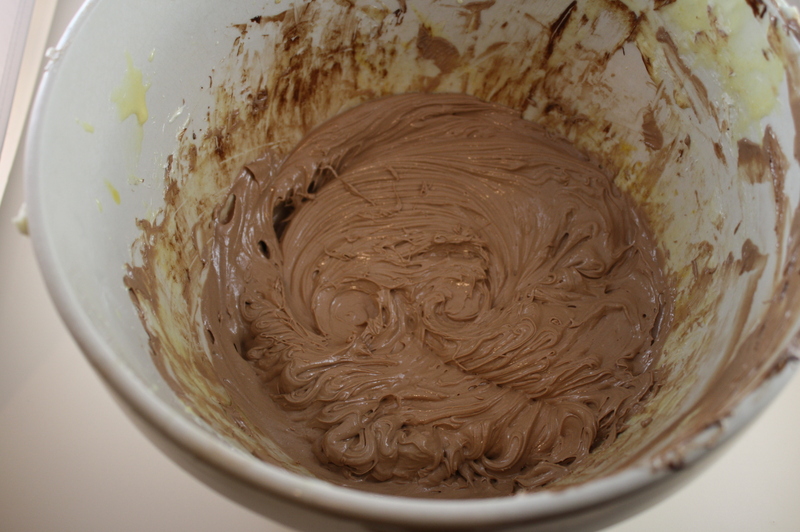 The batter was a little weird before you put in the egg whites…it was more like cookie dough. But once you put in the egg whites, it’s much more what I’m used to for cake batter. The buttercream was another story. 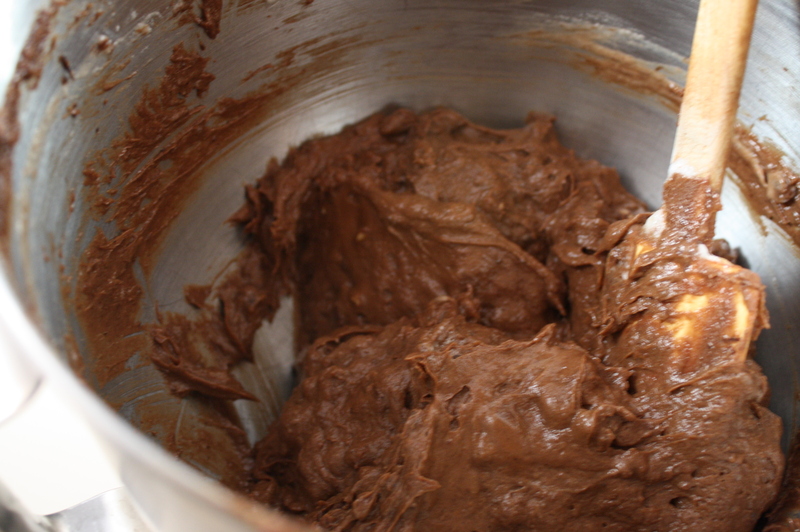 I’ve always wanted to make a real French buttercream, but always put it off because it seems too tedious. It took me two tries, but the second time around I had the hang of it, and it actually turned out pretty perfectly. I don’t have any photos of the process because you really have to buckle down and stay focused on the task, but if you follow the instructions carefully, it’s actually not that hard. 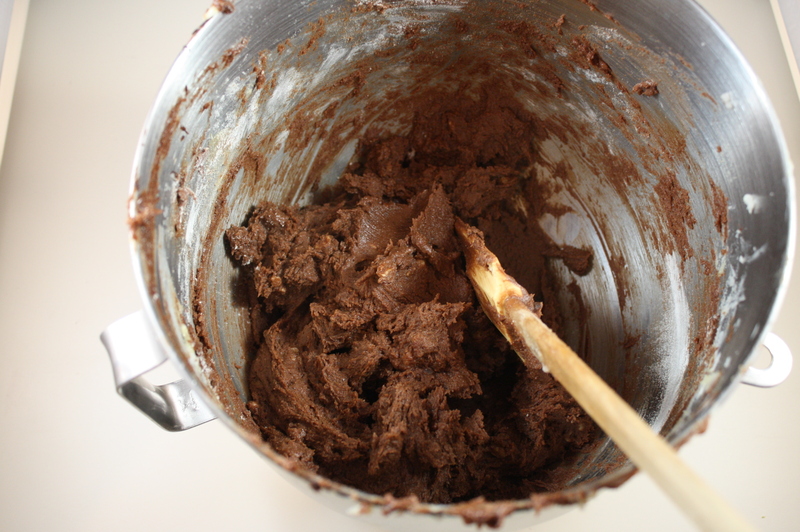 I added one note to the recipe…the first time around, I used my stand mixer, and I definitely advise against that. I was pouring the cooked sugar mixture into the eggs with the mixer running, like you should, but because the syrup hardens immediately as it cools, it was splattering into hard crystals on the sides of the bowl. It was pretty, and looked like spun sugar, but almost half of the syrup didn’t end up in the eggs like it should have! So the second time around, I used a hand mixer, which was more labor intensive but did the trick. I made this as a 6″ cake, since I wasn’t serving 12-14 people like the original recipe states. 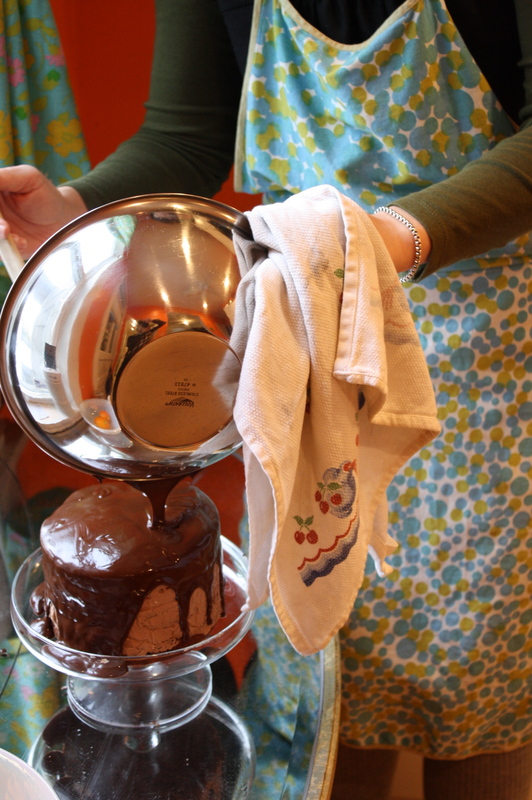 You can halve any recipe for a 9″ cake to make a 6″ cake. Some of the division is a little tricky, so you’ll have to use a calculator or conversion chart on the internet. Position rack in center of oven and preheat to 350 degrees F. Butter three 9″ cake pans with 1 1/2″ high sides. 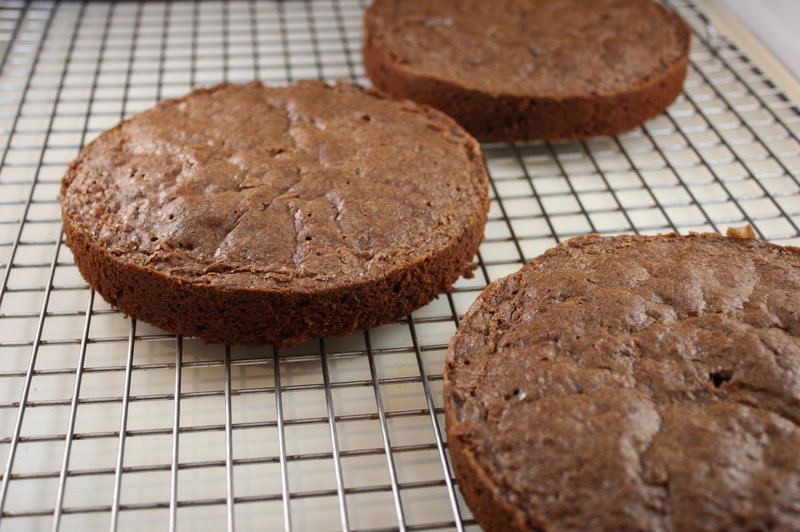 Line bottom of each cake pan with parchment paper. 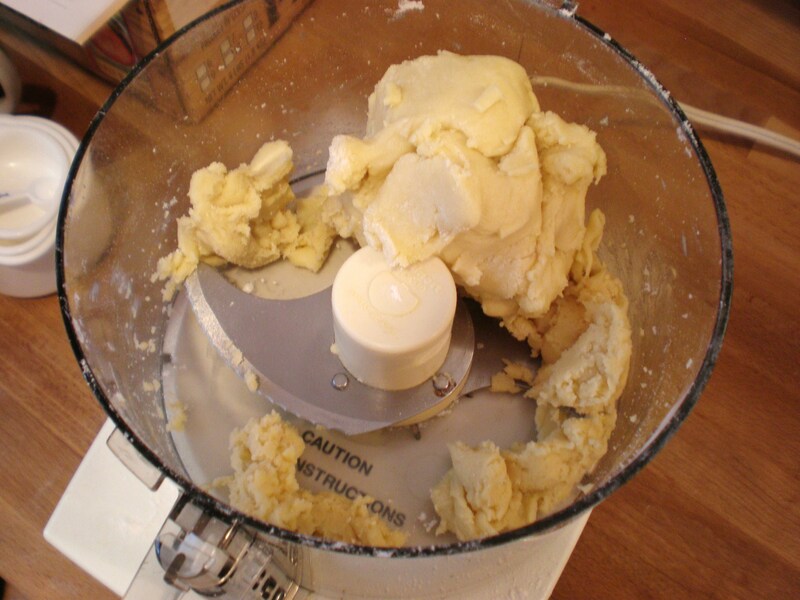 Using a stand mixer fitted with a paddle attachment, cream butter. Gradually beat in sugar until light and fluffy. Beat in egg yolks one at a time. Blend in melted chocolate. Slowly mix in pecans, vanilla and spices. Gently fold in flour in 4 batches (batter will be very thick and dense). Stir sugar and corn syrup in heavy medium saucepan over medium heat until sugar dissolves. Increase heat and boil 1 minute. Meanwhile, using electric mixer, beat egg yolks in medium bowl until pale and thick. Gradually beat in hot sugar syrup; continue beating until mixture is completely cool, about 5 minutes. (I used a hand mixer for this because with a stand mixer, when adding the syrup mixture half of it ended up on the sides of the bowl like spun sugar. I had to scrap a batch and start over.) Beat in butter one piece at a time, incorporating each piece completely before adding next. Blend in melted chocolate, then rum. (If buttercream looks broken or curdled, place bowl with buttercream over medium heat on stove burner and whisk 5 to 10 seconds to warm mixture slightly, then remove from heat and beat mixture again on medium speed. 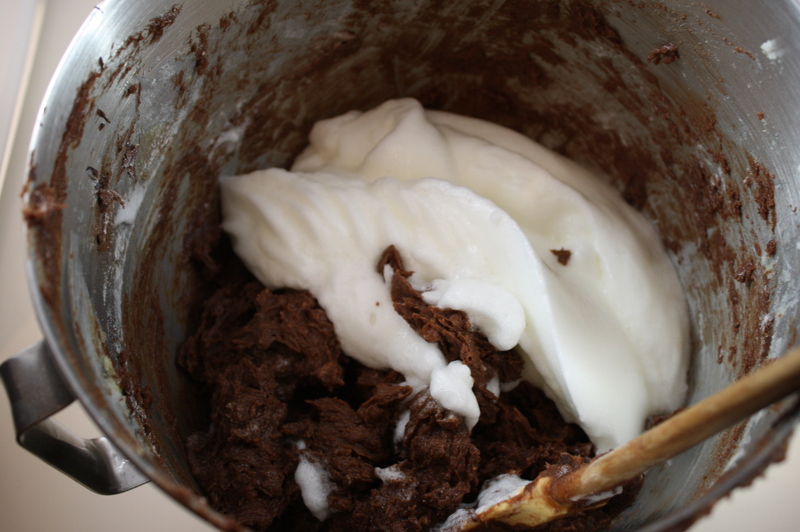 Repeat warming and beating as many times as needed until buttercream is smooth.) 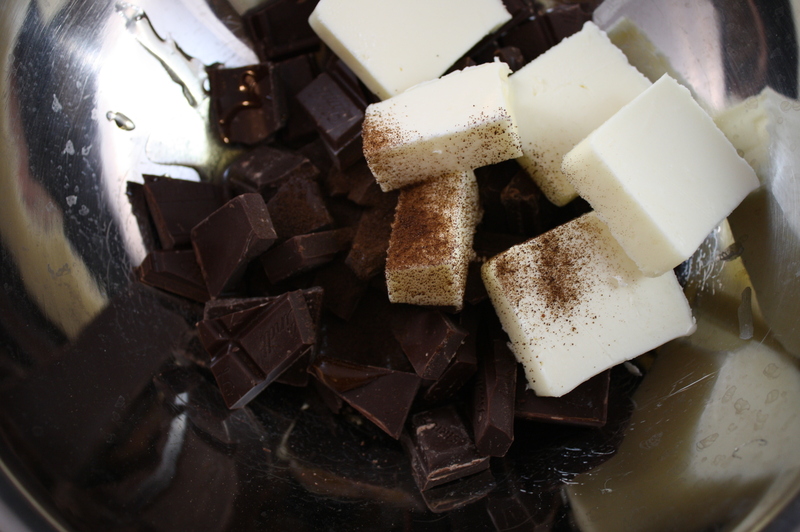 Chill buttercream for 30 minutes to firm it up before spreading it on the cake layers. Reserve 1/2 cup buttercream. Set 1 cake layer, flat side up, on rack; spread top with half the remaining buttercream. Top with second cake layer; spread with remaining buttercream. 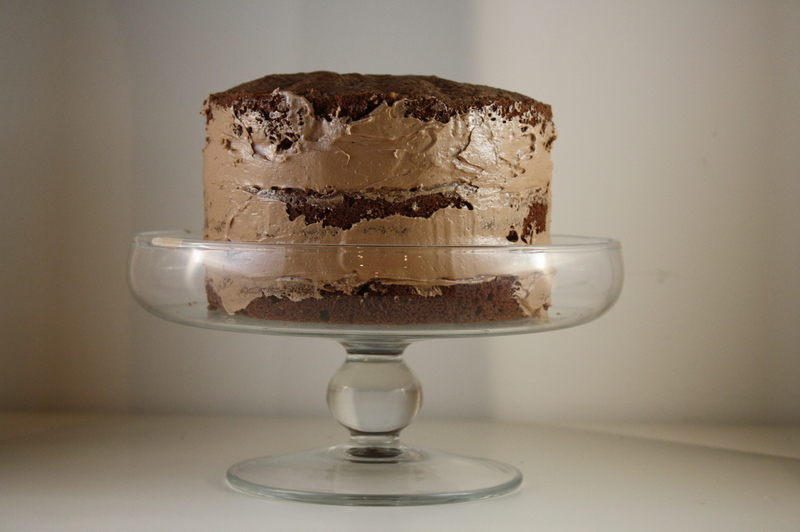 Top with third cake layer; use reserved 1/2 cup buttercream to fill in seam where cake layers meet. Freeze cake until buttercream is firm, about 2 hours (I wrapped it tightly in plastic wrap so that it wouldn’t dry out). 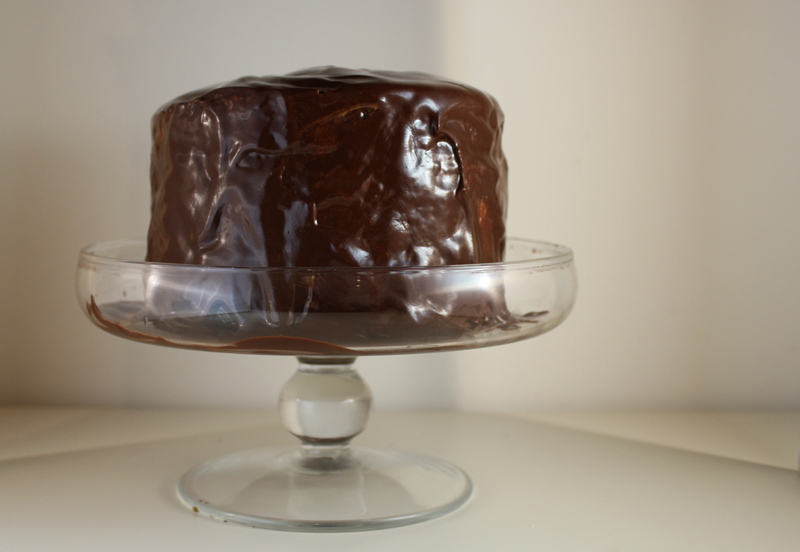 Place strips of waxed paper under the sides of the cake to catch extra glaze when it runs down the sides. Stir all ingredients in top of double boiler over gently simmering water until mixture is smooth. Remove from over water. Stir until glaze is thickened, about 5 minutes (do not allow glaze to set). Pour 3/4 of the glaze over the top of cake. 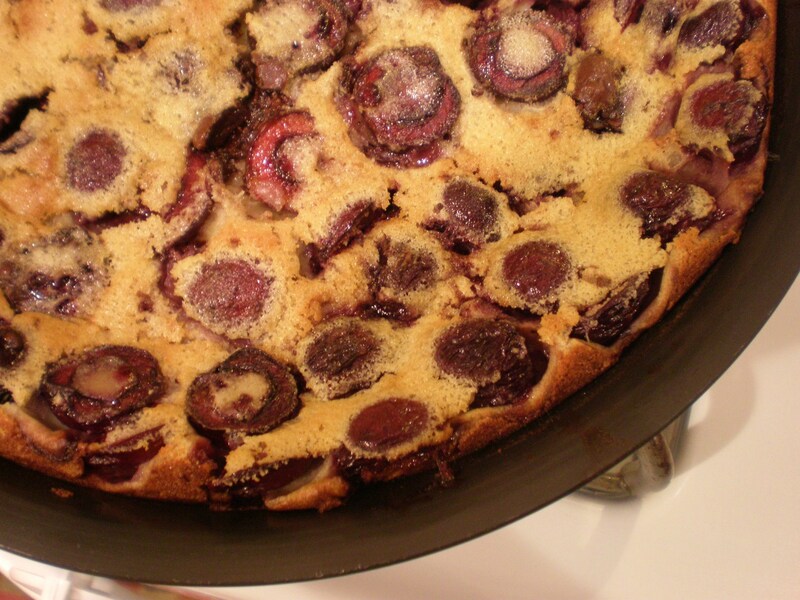 Carefully and quickly tilt cake back and forth so glaze coats sides; smooth sides with spatula, adding some of remaining glaze where necessary. Chill cake until glaze is set. Remove pieces of waxed paper. Cake can be prepared up to 1 day ahead. Cover and refrigerate. Bring cake to room temperature before serving. I had to give the cherry monster one for every two I pitted. 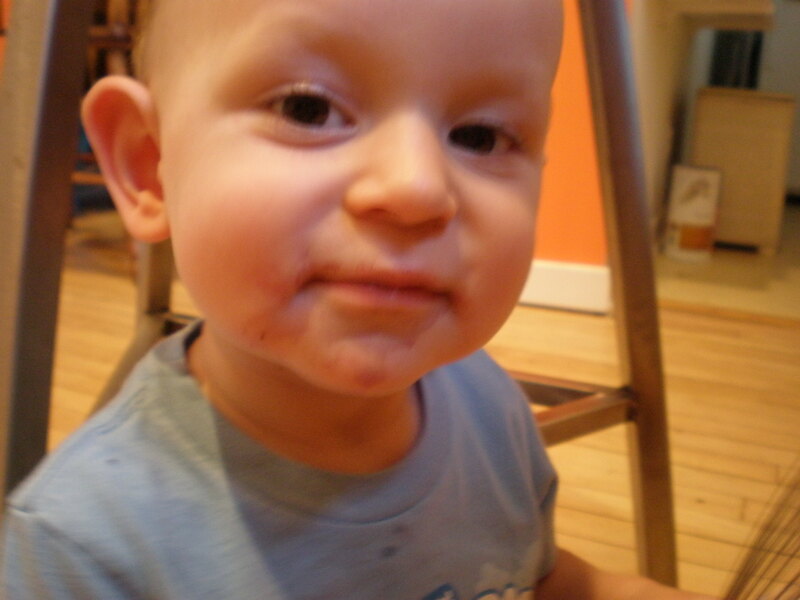 Note the cherry-juice chin. 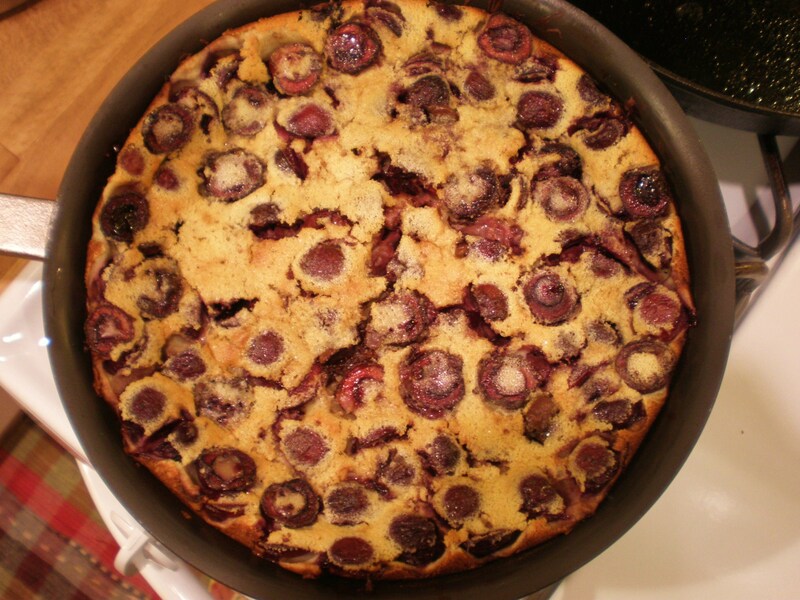 Apparently, purists bake their cherry clafoutis with un-pitted cherries, because the pit releases added flavor to the dish. I just think that dealing with pits when you’re trying to savor a dessert is not worth it…maybe I’ll try it that way sometime just to see. But it would have made this quick dessert even quicker, that’s for sure! 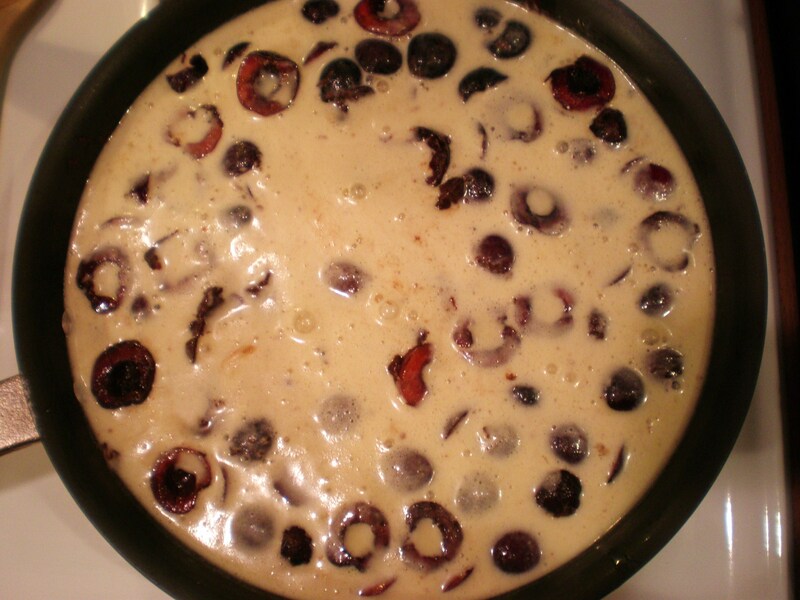 Grease 10″ iron skillet with 1 tbsp butter. 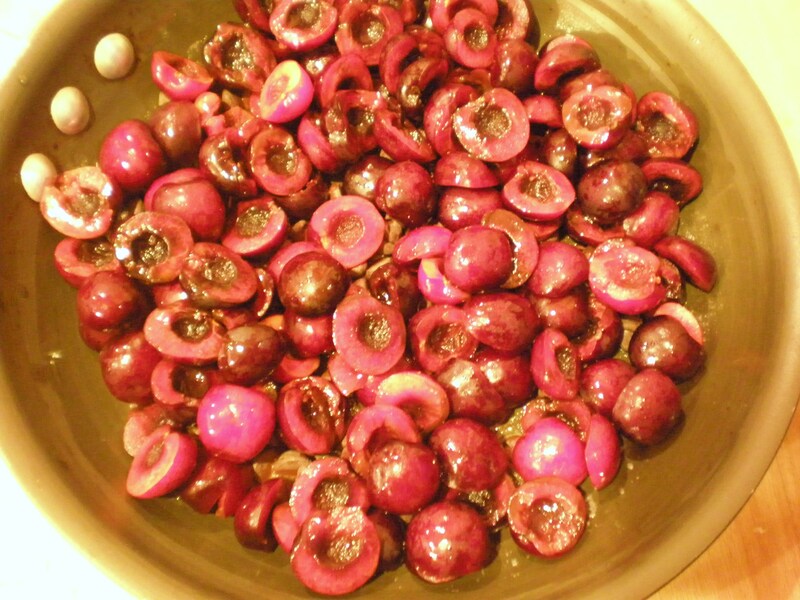 Spread cherries and chips in the pan. 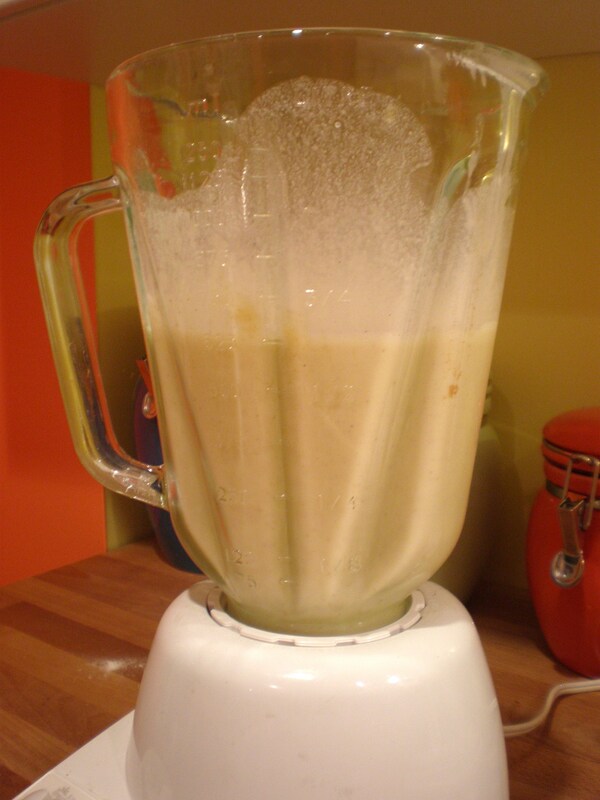 Place liquids in a blender. Add mixture of dry ingredients and remaining 1 tbsp butter. Blend until smooth. 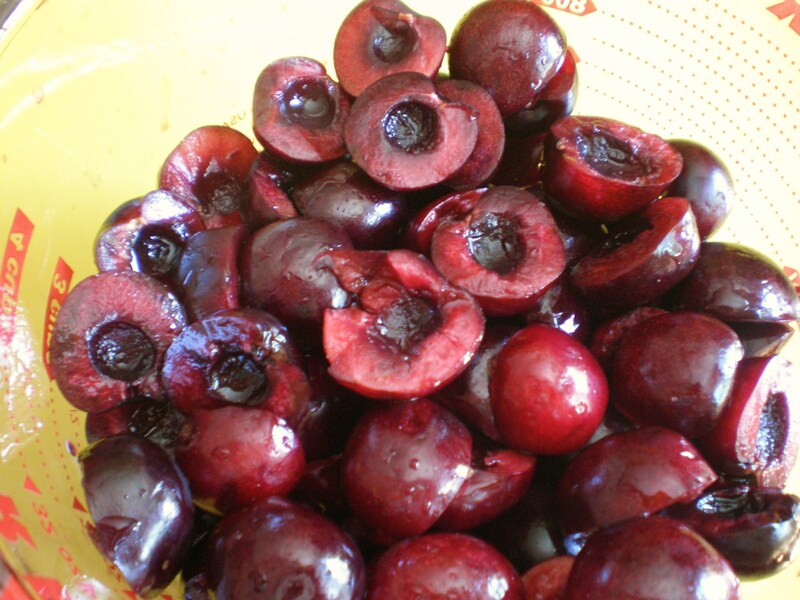 Pour batter over cherries and chips. Bake 55 to 60 minutes at 350 degrees. Cool 15 minutes before serving. Be sure its a 10″ skillet. 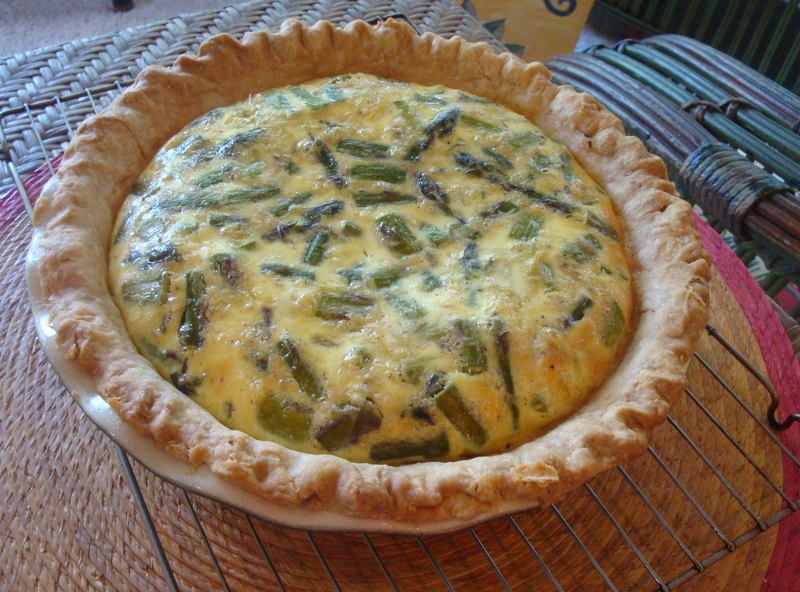 The batter will puff up and fill the skillet during baking, though it falls soon after it comes out of the oven. Serve warm with powdered sugar dusted over the top. (I served with vanilla ice cream…it was perfect).